If you’re planning on migrating an on-premise workload into Microsoft Azure, but haven’t yet worked with Azure, you may want to know how much to expect your monthly bill will be. Thankfully, there are several tools at your disposal in estimating costs, and assessing which systems are ready for Azure. 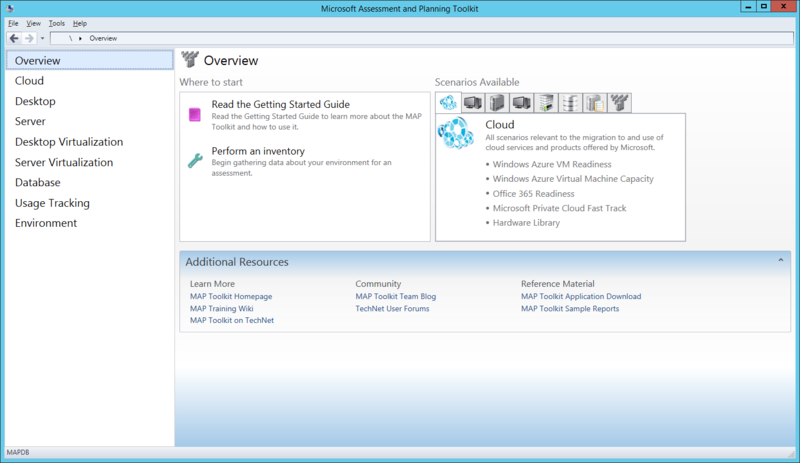 This series we will look at the Microsoft Assessment and Planning (MAP) Toolkit. In another series, we will look at the Microsoft Azure Cost Estimator tool. After the product has been installed, when you first launch/run the application you will be prompted to provide a Data Source for the tool to use. Within the ‘Create or select a database’ area, enter a name for the database (i.e. MAPDB), then click OK.
Once you have configured the MAP toolkit with a data source, you will first see the Overview screen. The first thing that you need to do is perform an inventory of your environment. Start by clicking Perform An Inventory. This will initiate the Inventory and Assessment Wizard. On the Inventory Scenarios screen you will be able to select from a list of scenarios, which will affect what data is collect, and what assessments are done. For this specific example, we will use the Windows Azure Platform Migration Once you have made your scenario selection(s), click Next. On the Discovery Methods screen, you can choose which methods will be used to discover (and subsequently assess) the systems in the environment. For this example we will use Active Directory Domain Services. Since this example is using the Active Directory Domain Services discovery example, the next screen requests the credentials to use. Supply the credentials required specific to the discovery method you are using, then click Next. Note: Each discovery method has its own Credentials screen, in which to supply appropriate credentials applicable to the method being used. Again, because this example is using the Active Directory Domain Services discovery method, the next screen provides the ability to be more granular in the inventory (i.e. choosing a specific Organizational Unit). If you are using the Active Directory Domain Services discovery method, make any necessary adjustments to the discovery options, then click Next. Note: All other discovery methods do not have similar granularity options, on the Active Directory Domain Services discovery method does. On the All Computers Credentials screen, provide credentials that are specific to the platforms and technologies that will be assessed against. In the case of the Windows Azure Platform Migration scenario, this includes Windows Server, Internet Information Services (IIS), and SQL Server. Click Create to enter account credentials. In the Account Entry dialog, enter the account information as the example shows (i.e. Domain\UserName), then click Save. After all the applicable accounts have been added, click Close. Back on the All Computers Credentials screen, click Next. Note: The credentials you provide must have Administrative permissions on the computers you plan to inventory. Also note that you can specify that the credentials supplied are specific to a certain technology. For example, if your Windows Administrator account does not have administrative rights in SQL Server itself, you could provide 2 sets of credentials; one for Windows, and another for SQL. 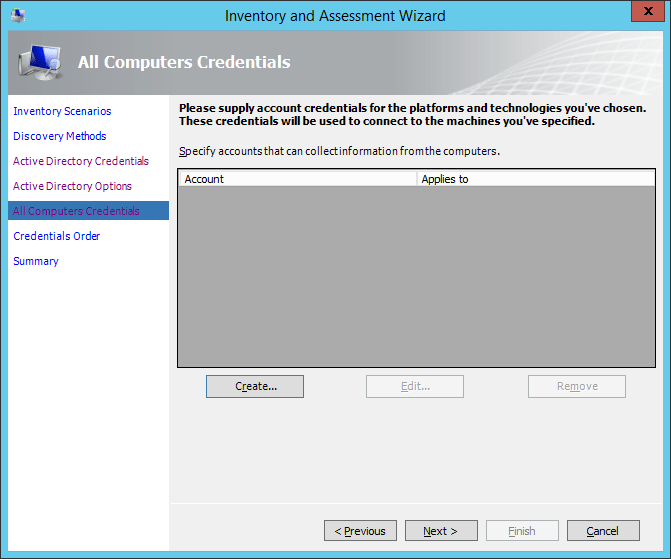 On the Credentials Order screen, if multiple accounts were supplied for the same technology, you can specify the order in which the credentials will be tried. Once any required modifications have been made, click Next. You might question when or how this may be used. Consider the following scenario. Perhaps there are a set of Windows Servers or SQL Servers in the environment which are classified as “sensitive”, in which the regular Administrator accounts used throughout the environment do not have sufficient access rights. In these cases, you can included the “sensitive” Administrator accounts within the credentials supplied, in order to effectively perform the inventory and assessment. On the Summary screen, you can review all of the settings, etc. that have been supplied in the wizard. Once you are ready to start the inventory, click Finish. This will automatically initiate the data collection process. The Data Collection process will start, and you can monitor its progress. 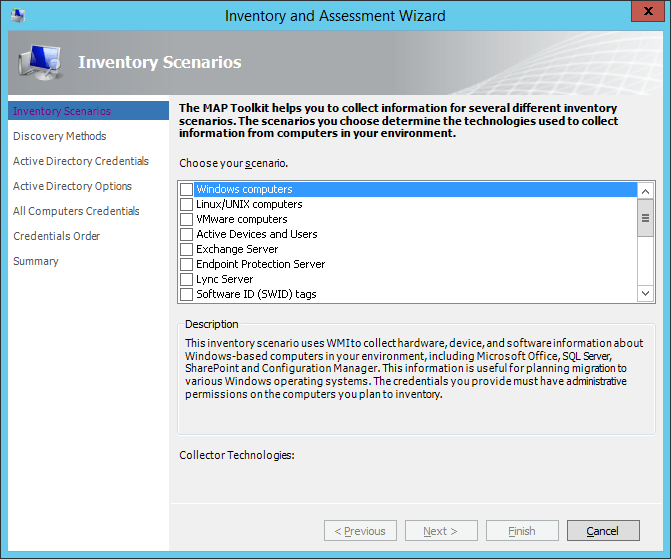 When it is complete, you will be able to see how many objects were collected specific to WMI, the Registry, and SQL. With the Inventory and Assessment data collection complete, click Close. Note: Depending on the Discovery Method chosen, the number of systems to discover and assess, and the performance/availability of the environment, the data collection process may take significant time. Back on the Overview screen, it will display the success rate of the inventory. Now that we have completed the inventory of the environment (against the system we want to assess), we next need to collect performance data; which we will cover in Part 3: Collect Performance Data.